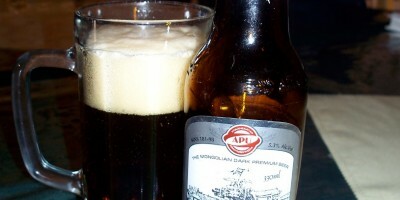 This is my eighth winter in Mongolia and fourth in Ulaanbaatar. 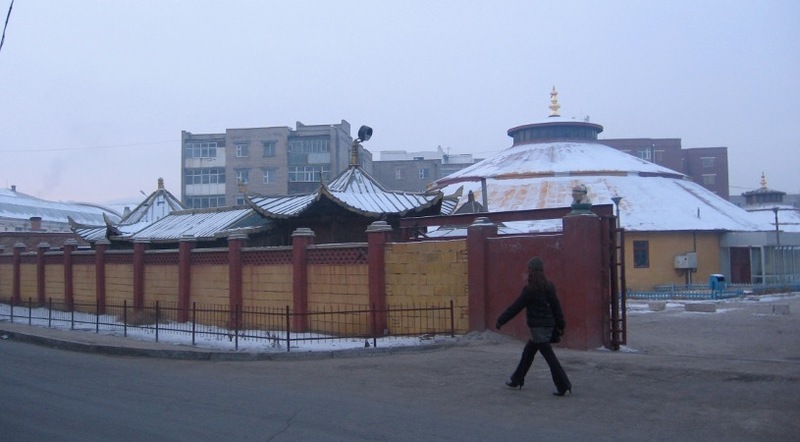 When it comes to cold weather, Ulaanbaatar is one of the coldest places in Mongolia. It is also by far the coldest capital in the world (see here). But, this year it has felt relatively warm in comparison to previous winters. Don’t get me wrong. 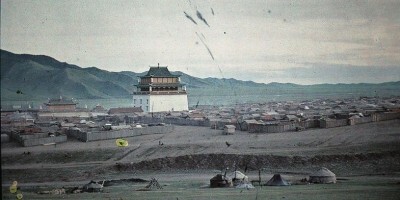 It’s still colder than most of humanity could or would want to endure, but it doesn’t feel “Ulaanbaatar cold” this year. As usual, instead of just expressing my feelings, I decided to investigate the numbers. 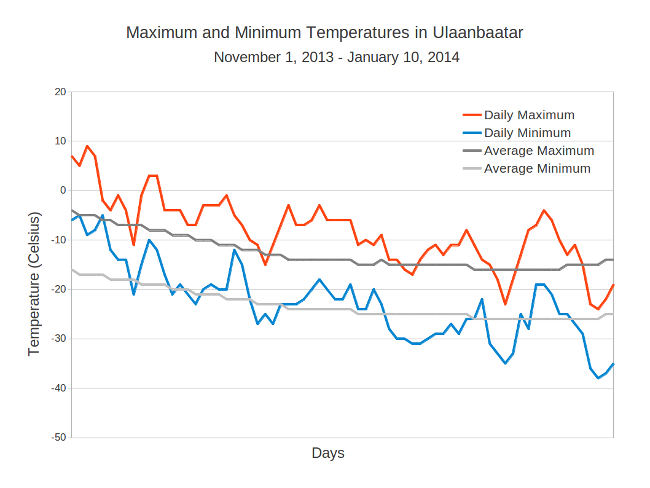 The graph above shows daily maximum and minimum temperature readings in Ulaanbaatar courtesy of the website “Weather Underground.” The average maximum and minimum temperatures for each day are also plotted. The graph clearly shows that from November 1, 2013 to January 10, 2014, maximum daily temperatures have been mostly above average and minimum temperatures have been oscillating around the average. 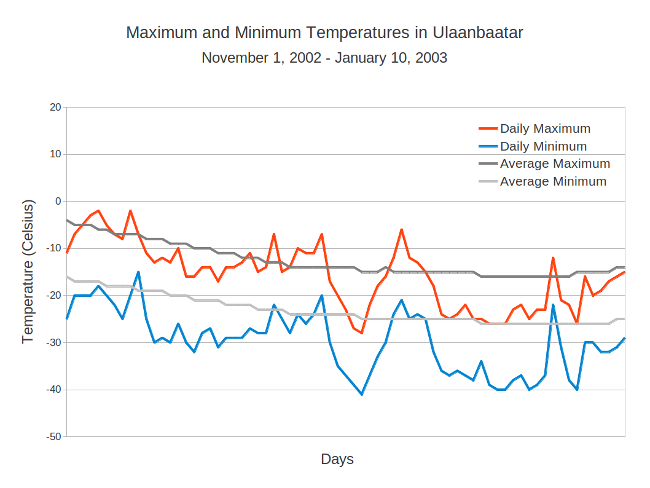 By way of comparison, I also plotted the maximum and minimum temperature data over the same period during my first winter in Mongolia twelve years ago in the graph directly below. That was a winter of mostly below average maximum and minimum temperatures. In fact, the temperature was not over freezing the whole period and rarely went above -10C. The difference in the two winters is even more stark when you compare them further as I have in Table 1. In every way the winter of 2002-03 was colder than this winter. The take away of this post should not be that this is proof of global warming1 but rather a simpler message: This year is above average in temperature in Ulaanbaatar. If this is your first winter in Mongolia and you’re thinking, “This ain’t so bad,” unfortunately you still have not seen the worst Ulaanbaatar can throw at you. 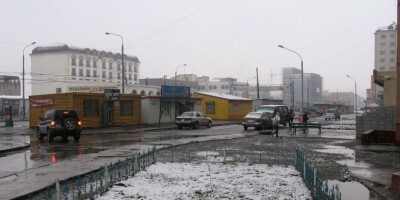 You’ll have to stay on another winter to have a shot at being a true “Ulaanbaatar cold” survivor. 1. Full disclosure: I think available scientific evidence supports the theory of Global Warming and man-made climate change even if this post is not intended as further evidence of the theory.